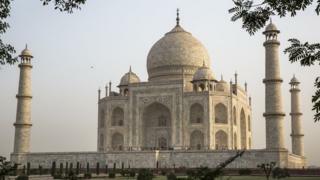 A Japanese tourist has died after allegedly slipping down the stairs at India's Taj Mahal monument. Eyewitness Sagar Singh told BBC Hindi that the tourist fell while taking a selfie at the Taj Mahal's Royal Gate. Police said he lost consciousness immediately after the fall and succumbed to head injuries in hospital. The Taj Mahal, a 17th Century mausoleum built by Mughal emperor Shah Jahan after his wife's death, attracts about 12,000 visitors a day. Agra tourist police officer Sushant Gaur told BBC Hindi that the Japanese tourist had been with three other people when the incident occurred.